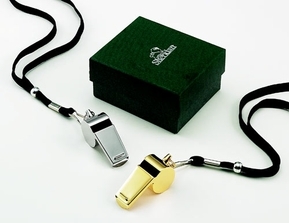 The non-tarnish finished stainless steel coach's whistle is wonderful gift for on or off the field. The whistle includes a black adjustable lanyard so coach can keep his hands free. Dimensions are 2" x 1" x.75". Pictured gift box included.